Squash House Quilts: Birthday Celebration Giveaway! I've been working almost non-stop for the past three days - packing away and sorting more stuff, spackling, taping, changing cabinet hardware and even threw in a little gardening. We have a handyman coming next weekend to begin painting and making small improvements and repairs around the house. I really feel like progress is being made! The only downside is that I'm a bit behind in reading my blogs and posting, but hope to catch up in a couple of days. I have an out of town training all day tomorrow, but will be back to a somewhat normal schedule on Wednesday! Next Sunday is another anniversary of my 30th birthday. What better way to celebrate than to offer a giveaway for you! 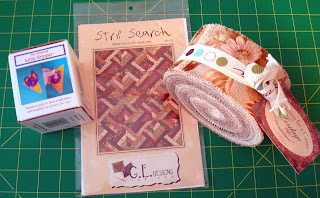 Just leave a comment on this post or any other post this week through midnight January 24th, and be eligible for a jelly roll from Moda's Collection for a Cause Heritage, a jelly roll pattern with the very strange name of Strip Search, by G.E. Designs of Iceland (must be Icelandic humor!) and a fun new tool, The Little Gripper for all of those small templates you work with! ooooooo lovely. How cute. Congrats Candace. I know you've been working your little heart out! Nice giveaway prize!! I am new to your blog and have enjoyed reading your posts! What a generous gift. What a wonderful giveaway!! Very generous. I enjoy your blog and love the giveaway prize. Happy Birthday!! How nice to do a giveaway! Happy happy birthday! Lovely giveaway. I'm also having a birthday giveaway - I'll be posting details on Wednesday. Drop by and see! Happy Birthday Candace! I luv your blog and all that you put into it! I also luv your giveaway! That is such a great gift to someone else on your birthday! I luv the fabric, tool and pattern--oh to be so lucky--one can only hope! Enjoy your special day and every other day! Very Happy Birthday wishes to you. I found your blog through the Whirl in Winter Giveaway. It's been fun reading. Count me in on your giveaway. I've never seen a jellyroll except on pictures. Alright, 30th birthday of what? Did I not read the post correctly? It is late! lol Hope you find time to take care of yourself! Cheers! Happy 30th Birthday - again. I never heard anyone put it that way. Very good. You have been busy and time does fly when you are busy and having fun. Funny...strip search! Happy Anniversary of your birthday. I'll have to remember that. I decided once I hit a "certain age" I'm going to start counting backwards. You're always so generous with your giveaways! Anniversary of your 30th birthday? I love that! I'm going to steal that one! How sweet to give us presents on your birthday! Thanks! Do you have a German heritage? They give out presents on their birthdays rather than receiving them. Happy Birthday and what a generous gift! Hope you have a wonderful year. I know packing can be such a pain, but just wait before you know it, you will un-pack and that will be fun!! what a wonderful giveaway. Strip Search! lmao! That is just too funny! Happy Early Anniversary Birthday! :D I hope you have a wonderful day planned! What a wonderful idea & so useful!! I think you might have a typeo in that entry. LOL Didn't I see in your profile you are 50 something like me? Have a great birthday. And please enter me in the giveaway. Love the fabric. Love the great gift giveaway. I come to your site often since I started blogging Jan.8 2009. My daughter set it up for me but I am loving it. I hope I win. Have a great day. Happy Birthday to you. Just found your blog. Thanks for having a give away. Happy Anniversary!! I've been having anniversaries of my 30th for quite some time now... Great giveaway prize! Happy Birthday. Hope it's a great one. You have such lovely giveaways ... I'd love to be in this one. Best wishes for your birthday Candace!! Happy Birthday, a little early! Hope you don't have to spend all day Sunday packing, cleaning, sorting, etc. Great giveaway! Happy anniversary. I am new to your blog also and have been enjoying it very much. So nice of you to offer a gift to someone else on your anniversary! I thought I signed up for this already. . .but now I can't find it. . . anyway,, count me in. BEST WISHES for a very happy BIRTHDAY on Sunday, and have fun anticipating your birthday in the days ahead too ! I had the anniversary of my 30th this past week. Each year seems to get better and better! Hope you enjoy your day and thank you for entering me into your contest! I found your blog recently and have enjoyed it a lot. Love your blog! Happy Birthday! Hope it is a great one! Love your blog. Happy birthday again. My husband celebrates his 39th every year. Please enter me in your drawing. I'm new to your blog...I found it on another quilter's blog site and have marked you in my faves! I like the name Squash House Quilts...as you can see by my email address!